The Dalmatian Coast is home to some of the most well-preserved medieval fortresses, palaces, and cathedrals, including the historic sites of Hvar Island. With just one day in Hvar, you may not get the chance to see everything. It’s one of the top places to visit in Croatia, so you’ll also need to deal with long lines and crowded streets. The island caters to tourists by providing access to endless bars, restaurants, and shops. It’s easy to get distracted by these modern amenities and miss out on the history of the island. Need help planning your trip? Get started with this complete 1-day Hvar itinerary. Hvar is a beautiful island with a long list of attractions and things to keep you busy. While the island may look small, it covers several kilometres of hilly terrain. Whether you’ve got 10 days in Croatia or a month, Hvar Island is a necessary stop. Reaching any of the nearby villages or beaches would take up too much time. 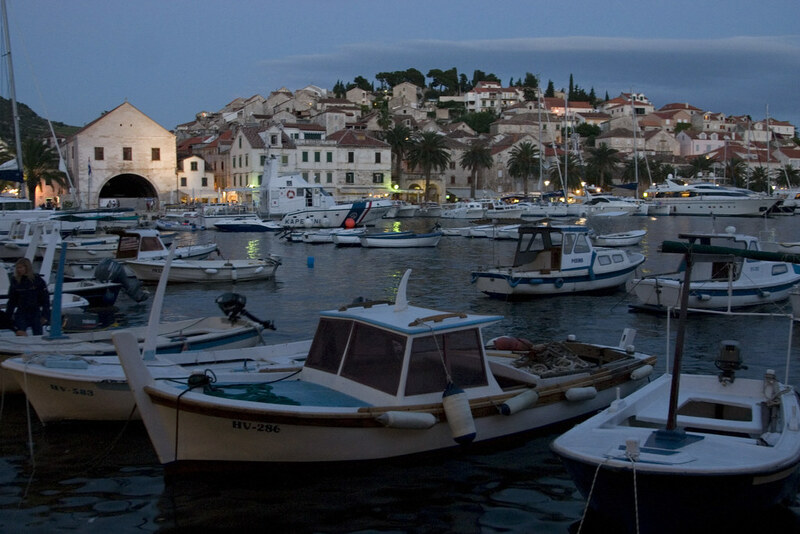 With just 24 hours in Hvar, you’ll need to spend almost the entire day around the main port. Luckily, the port is where you’ll find most of the historic sites and top landmarks. Like all of our 24-hour city itineraries, this trip to Hvar packs as much sightseeing and entertainment as possible. To ensure that you’ve got enough time in Hvar, consider staying in Split and taking a boat first thing in the morning for your self-guided tour around the island. Most travellers reach Hvar via a ferry from Split that drops them off at the main harbour. This port area is always busy both on land and the sea. Cruise ships regularly drop off passengers for short excursions. If you arrive early enough, you should beat the crowds, making it easier to get breakfast from one of the restaurants. The harbour caters to a diverse crowd, giving you a lot of food options. You can try some authentic Croatian cuisine, or stick with something simple such as fried eggs. Choose a spot with outdoor seating so you can take in some of the views before you start exploring. From the harbour, you can see some of historic Hvar, including a few of the destinations you’ll be visiting throughout the day. Behind the port, the island rises along a large hill lined with trees. Cut into this landscape are the various historic sites and the town. When you finish eating, take the only road going north from the port, directly toward the middle of the hill. You can see your next destination as it stands sentry over the entire island. In fact, you can see it from just about any spot on the island. Tvrdava Fortress is an elevated medieval structure built in the 13th century to help protect the port and town. It’s been upgraded and renovated multiple times over the centuries. You can walk the ancient walls and get panoramic views of Hvar and the sea. It only takes a few minutes to reach the entrance to the fortress and another 20 minutes to reach the top battlements. It’s worth the climb to see one of the top attractions in Hvar but make sure that you wear comfortable walking shoes. At the top, you can take a break at the terrace café. Refreshments are reasonably priced and help cool you off. There are also a few sites to check out inside the fortress. The interior is a maze of passageways and staircases leading to storage rooms, gun ports, and barracks. Some of these areas are closed while others offer museum-like exhibits. 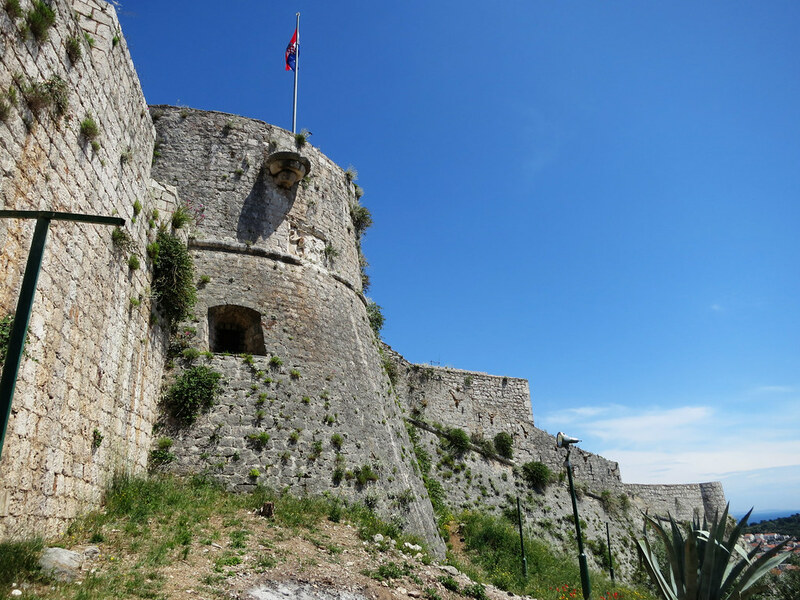 Take your time at the fortress as it’s the main highlight of your Hvar itinerary. Stop at the various exhibits, learn more about the history of the island, or enjoy the expansive views of the harbour. The only way back to Hvar is the way you came. Retrace your steps back to the port. The next stop on your Hvar itinerary is one of the oldest public theatres in the world. You’ll also pass a few restaurants, as you need to take the main road along the harbour to reach it, so if you skipped breakfast, you can always stop along the way. You’ll spend the rest of the day around the main harbour. If you get hungry at any point, you’re never more than a few feet from another restaurant or café. As you walk along the main road, you’ll come to a large courtyard surrounded by medieval buildings. The largest of these buildings is the Arsenal, an ancient refitting station for galleons. While the Arsenal is a historic site, the main attraction is on the second floor of the building. Built in 1612, the Hvar Public Theatre is considered one of the oldest public theatres in Europe. It was recently restored, helping to highlight some of the original features. The ceiling includes paintings while the walls are adorned with various fresco artwork. The theatre is open daily but closes for a few hours in the middle of the day. If you arrive by noon, you should have time to tour the area. If it’s already closed for midday, you can come back after visiting a few more spots. Whether the theatre is open or closed, you’ll need to travel south along the harbour. You’ll have seen the next site as you arrived at the island. The Franciscan Monastery was built near the edge of the island and looks out to the sea. It’s almost 800 years old and still a functioning building. When you reach the monastery, turn around and take in a different view of the harbour. While 30 or so Franciscan monks used to manage the place, it now houses just one monk who cares for the entire monastery. The interior contains several priceless works of art including religious paintings from the 16th and 17th centuries. You can walk through the monastery and view the treasured artwork, take a break in the gardens, and then take a quick tour of the monastery museum. After you finish wandering around the monastery, it’s time to visit one of the most noticeable landmarks on the island. When seeing Hvar in one day, you’ll pass St. Stephen’s Square several times. It stretches from the harbour to St. Stephen’s Cathedral. The square was once an inlet that reached the bay. It was filled with earth and paved with stone, covering 4500 square meters. From the square, you can see most of the town. The residential parts of the historic town are along the slopes to the north while the cathedral is to the east. The square is flanked with medieval-era buildings that now house restaurants, museums, and cafes. This is one of the most crowded areas on the island and a great spot to eat, rest and people watch. Travel along the square toward the towering St. Stephen’s Cathedral. The façade of the cathedral is quite impressive with three arches and a large bell tower. The main arch is the doorway while the two adjacent arches have large stained-glass windows. While the outside is memorable, the interior includes more priceless paintings. You can view works of art from some of the most famous artists of Dalmatia. No entrance fee is required to enter but a donation is recommended. The hours can vary so there is a chance that the cathedral will be closed. If the doors are not open, try visiting the Episcopal Museum next door. It’s part of the cathedral and includes a large collection of religious documents, art, and books. Just a block from St. Stephen’s Cathedral, you’ll find another historic church. The Benedictine Monastery was built in the 15th century and was once a girls’ public school. It’s no longer a working monastery but does include a museum. The museum includes artwork from the nuns who ran the nursery school. It’s an interesting collection, especially after viewing the paintings housed in the other monastery and the cathedral. The monastery also has its own gift shop. The most popular items are lace decorations made from agave fibre. The nuns would make the lace by weaving fibres from dried agave leaves. The goods are expensive, but it’s a chance to pick up a few souvenirs. As with most of the places that you’ll visit in Hvar, the monastery closes at midday. If it’s closed, just stroll the town and see what else you can find. It’s hard to get lost as the hillside is always to your north and the sea to your south. Seeing all of Hvar in 24 hours isn’t possible. Even if you take a taxi or rent a scooter, you’d spend half your time travelling from one beach or village to the next. 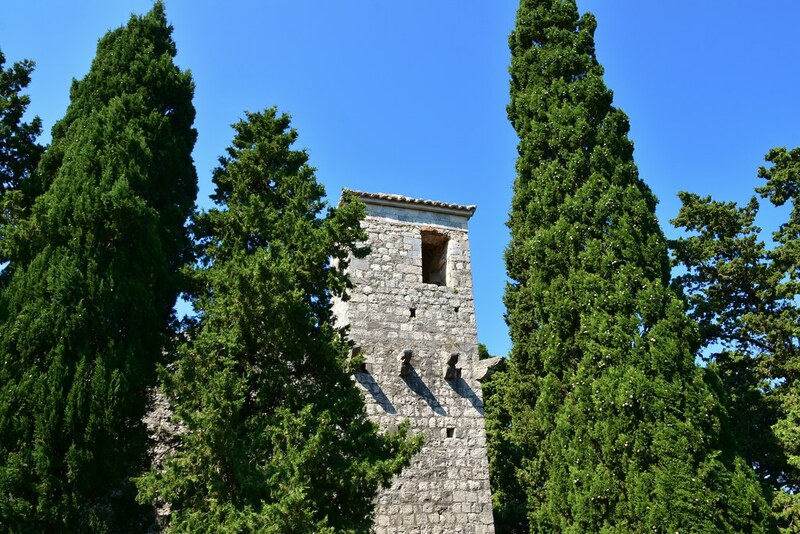 While this itinerary took you to all the historic sites in Hvar, consider exploring more of the island on your next trip. Aparthotel Pharia: One of the top budget-friendly pick in Hvar, this aparthotel sits just 15 minutes from the centre of town and is located just steps away from the beach. Both the modern rooms & seaviews here are sensational. Hotel Fortuna: A quieter alternative to Hvar’s hard-partying ways in the smaller village of Milna. Several pebble beaches in the area are perfect for relaxing on Croatia time. Adriana Hvar Spa Hotel: The best option for luxury in town, this lovely hotel offers hip, modern rooms with amazing amenities including a brand-new rooftop pool, a terrace bar, and a spa.